The foundation provides financial aid to the needy (could be a student, single mother /father, sick or poor or anyone else who has a real need). 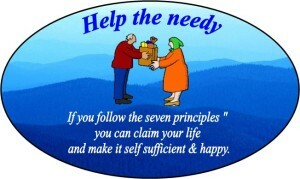 However needy and the needs are required to be real and genuine. 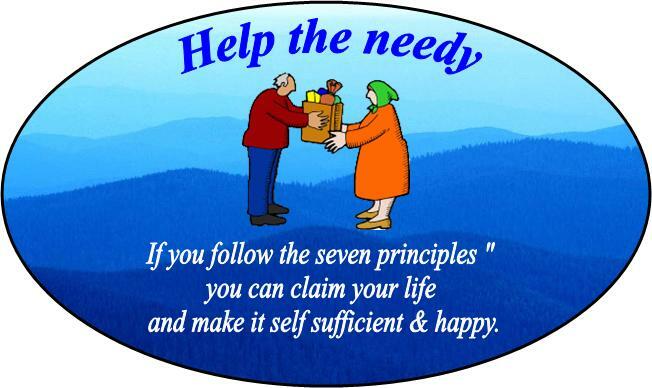 The founder strongly believes that if people follow “The Seven Principles” as described in the previous section. and carry out their life properly, he/she would be become self sufficient and happy, and would not require any assistance from others. We are masters of our life. The founder calls “these seven principles” a tool kit for life. Specifically consider “the principle of achievement and evaluation“. If you are goal oriented and have an achievement in mind, success would be yours. You will not waste your time or money. By tuning in to achievements your capacity to earn wealth will increase. In student life think in terms of “I have to get better marks in school, I will excel in extra-curricular activities, I will find a part time job, I will not waste hard earned money on drugs /smoking or unnecessary material possessions” and this will never let you get impoverished. In adult life think in terms of “I will find a job, in job I will finish my objectives, I will not waste my hard earned money” and you will never be “poor”. Vinesh invites you to ponder over these principles of life and make a pledge to stick to them. This is the key to become self-sufficient and happy. However due to circumstances and turn of time if you need help to put your life “in order”, you can apply to get “seed money” for assistance – Fill out the enclosed form and send it to the following address. You can be student, single mother/father, sick and poor or adult in need. To print this form click the link below. Describe your circumstances why do you need assistance? What kind and how much assistance do you need from this foundation? If you are under the age of 18 then your parent’s signature & recomendation is also required .